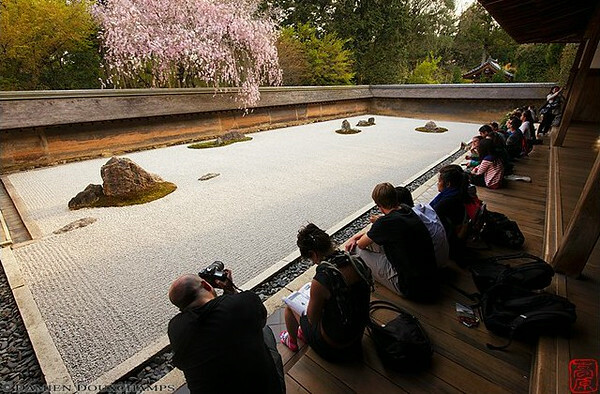 Kyoto is the spiritual center of Zen Buddhism in Japan and it’s only fitting that some of Japan’s most sublime Zen gardens can be found here. 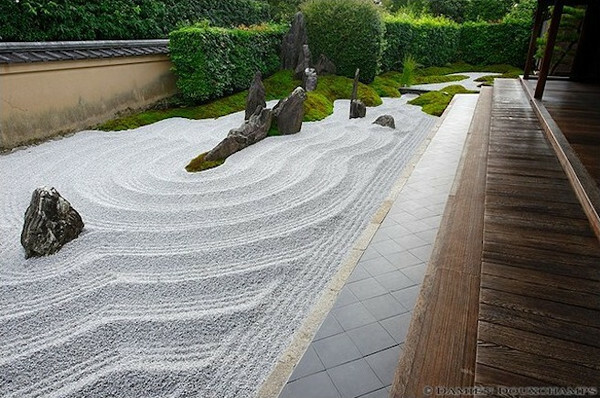 The term “Zen garden” is a bit of a misnomer. The correct term is “karesansui” (dry landscape garden) and karesansui gardens can be found at temples of all Buddhist sects. 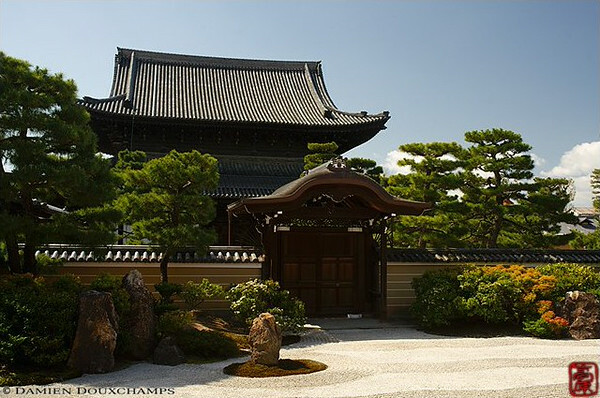 However, karesansui are particularly common at Zen temples and Kyoto, which has an abundance of Zen temples, is naturally home to some of the finest examples in the land. As the name suggests, karesansui gardens are devoid of water. Rather, they use other features, most notably gravel and, occasionally, rocks, to give the appearance of water features. 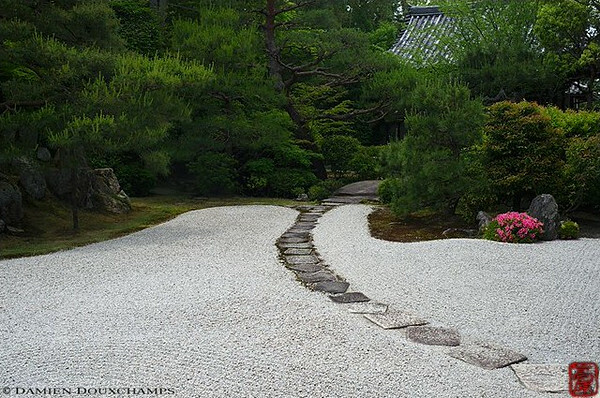 Some karesansui might have bits of greenery or even trees, while others adhere to the strict compositional elements of only gravel and rocks. The real pleasure of gazing at a karesansui garden is like looking at clouds in the sky: you can let your imagination run wild and imagine all sorts of “meanings” and shapes. 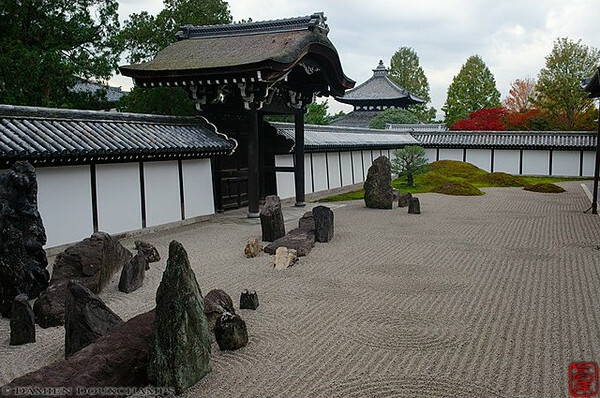 The most famous karesansui in the land, the garden at Ryoan-ji Temple, with its 15 mysterious stones, is laid out so that all of the stones can never be viewed at one time. As for the meaning behind the design, it went to the grave with its designer. Needless to say, if you love Japanese gardens, you’ll almost certainly love karesansui gardens, which in many ways epitomize the most appealing characteristics of Japanese aesthetics: simplicity, elegance and restraint. I put this on top of the list with some misgivings. Oh, make no mistake, it’s sublime, but it’s also almost always crowded and this type of garden should be enjoyed in silence. Go first thing on a Monday morning and enjoy the quiet while it lasts. I’m crazy about the Hojo Garden here, which was designed during the last war by Shigemori Mirei. It’s often blissfully quiet here, especially outside of fall foliage season. Only one side of the garden can truly be called karensansui, but why split hairs? It’s fitting that the oldest Zen temple in Kyoto would have one of the best karesansui gardens in the city. The shiny white gravel expanse is simplicity itself. Don’t miss it. Daitoku-ji Temple is actually a walled-in complex of smaller Zen subtemples, each of which has its own charms. If you can be there when the fine Obai-in Temple is open, do not miss it. Likewise, be sure to catch Zuiho-in. Not far from the front gate of Nanzen-ji Temple, this sublime karesansui masterpiece is often overlooked. Don’t make that mistake. It’s a rare garden in that it’s a karesansui that also shows the principles of shakkei (borrowed scenery), in this case, from the mountains behind the garden. 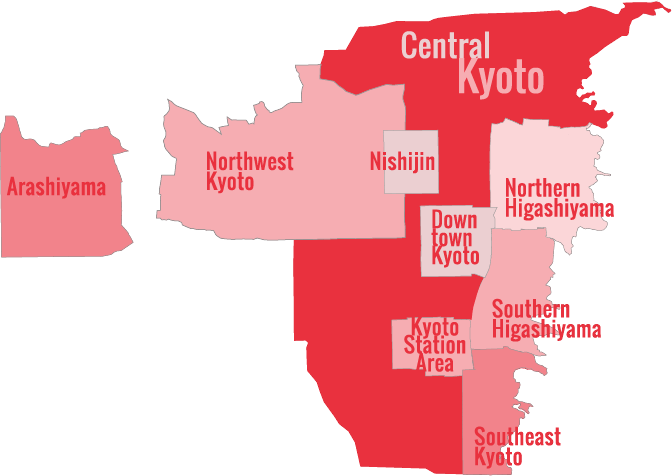 And if you love gardens in general, be sure to see Kyoto’s Best Gardens and Kyoto’s Best Green Spaces.